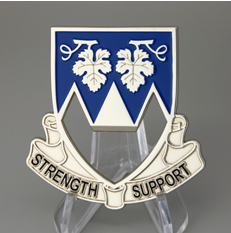 Challenge coins are a traditional honor way for all branches of military units. And we always are proud to design honor coins and recognize great men and women with these meaningful metal prizes. When we are not professional artist, we could be worrying about how to accomplish this masterpiece. 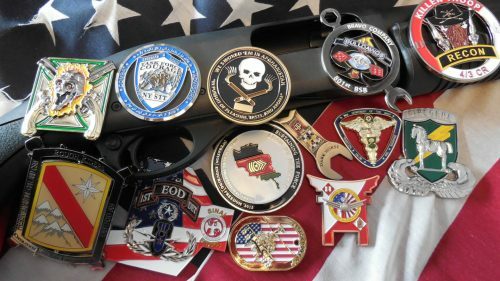 In this article, there are many useful tips about how to design the best military challenge coins for your group. We always know the designing a coin is not so easy. There are many elements we should play with. These may include the style, shape, size, arrangement of the elements, 3D design, colors and finishes etc. For military coins, soft enamel, hard enamel and antique styles are more popular style to apply. Soft enamel coins feature with vibrant image and logo, recessed enamel parts and raised metal areas are its main special character. And those hard enamel coins are polished with smooth and glossy finish. All the two crafts can make your custom coins more elegant and delicate. You can choose the style you are preferred. If you want to create military coins with serious style, die struck coins with antique finish is still the right choice. Most of cheap military coins are standard round in 1.75” or 2”. It’s the first challenge coin looks like, and so classic for any occasion and events. If you like unique coins, you also can create them as your symbol or logo shape. Custom coins can be designed in any shape. A perfect challenge coin should easily reflect the purpose of its creation. So the image on coins is the soul. How to design the image and logo properly? 2D and 3D design are the common choice. If your logo is simple, you can choose the 3D design to make it impressive. 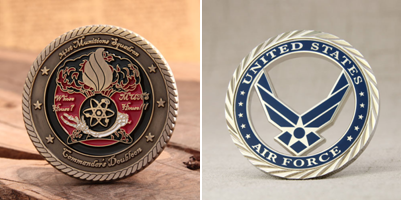 And the 2D images are available for all challenge coins, if the image has too many details, you can filled without any color or use offset printing or transfer printing option to replace. The effect of image will look more clearly. 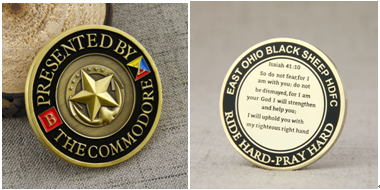 The best custom challenge coin that has brief message is to convey its meaning and keep the design clean. Because of limited space, short text or obvious abbreviations are welcome on challenge coin design. It makes sense. Most military coins feature with the unit symbol and slogan, very a few coins have printed with long oath. Besides standard edge option, one of popular edge option for custom military coin is rope edge. It is not only presents the unity and stronger of the Navy force, but give more elegance and special looking to your coins. Cross cut edge is still available for all five branches of the U.S. Armed Forces. Cut out design is another important factor you should consider. Some complex shapes are hard to design, and the cut-out process can bring amazing effects on our design. These popular finish options may include gold, silver, antique gold, antique silver and antique brass for military coins. Gold and silver finish can express a meaning of honor and pride for all receivers, just like the medallion. And antique charming from coins conveys honorable, valuable and historic feeling to recipients. 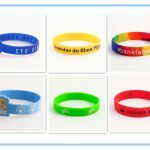 Color makes our life more beautiful, it also can create amazing appearance for your coins. The above two coins has same design, the left one is just die-struck without color and the right one has black enamel color. 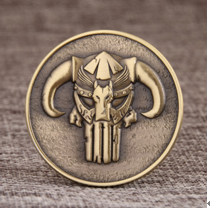 Both of them are awesome honor coins to give away, but the right one seems like putting life into design. It’s right? You can take the above as reference, or trying different combinations sometime. All these factors you choose can make your coins stand out. By nature, all designs and options on custom challenge coins should reflect your meaning, mission, goals, and values etc. Other presentations can help your make coins attractive as you want. 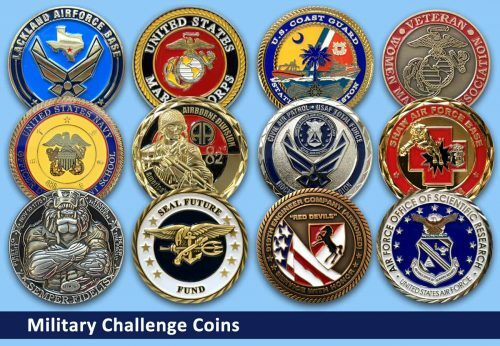 With these tips, it’s easy to start a military challenge coin now. Come on! 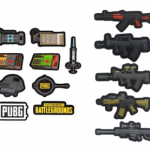 ← How to customize PUBG PVC Patches? oetenpir,If you are going for best contents like I do, just go to see this web page daily because it offers quality contents, thanks! idleoglr,Thanks for sharing such an amazing blog. I am so happy found this informative blog.